Clinell Alcoholic 2% Chlorhexidine is a disposable disinfection wipe for medical devices pre-saturated with 70% alcohol and 2% Chlorhexidine Gluconate. It was brought out to provide disinfection under guidelines set out by EPIC2 and Saving Lives. These wipes are a class IIa medical device regulated under the Medical Device Directive 93/42/EEC under the supervision of notified body number 0473, AMTAC certification services. Clinell Alcoholic 2% Chlorhexidine Skin wipes are ideal for cleaning skin after dressing and plaster removal, especially where the dressing has caused dirt to develop. The wipes have been dermatologically tested and are latex free. They are regulated under the Biocidal Products Directive (BPD) 98/8/EC and is subject to the procedures set out in the Biocidal Products Directive (BPD) 98/8/EC. The powerful cleaning formula contains two main active ingredients: 2% Chlorhexidine Gluconate and 70% Isopropyl alcohol. Clinell Universal Wipes provide a range of products for hands, surface disinfection and cleaning of non-invasive medical devices. Containing a unique, patented antimicrobial formula they can be used as a disinfectant, detergent and hand wipe - replacing the need for multiple wipes and surface cleaners. 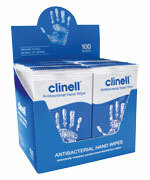 Clinell Detergent Wipes provide an ideal choice for multi-surface general cleaning and damp dusting. Specially formulated to thoroughly remove dirt from hard surfaces, the wipes offer a convenient and effective way to clean prior to disinfection. They contain a patent pending, unique, new formula which has even stronger cleaning power and ultra low smear compounds compared to any other competing detergent brand. Clinell Sporicidal Wipes are the most powerful wipes in the world and are used specifically to target Clostridium difficile. The wipes produce peracetic acid as the active ingredient which will kill all germ groups thus providing a direct and safe alternative to chlorine products. Clinell Sporicidal Wipes, which contains patented technology, are designed for use on all surfaces and non-invasive equipment. They are inactive when dry, and with the addition of water they immediately generate peracetic acid levels that are proven to kill all known micro-organisms. Clinell Spill Wipes are a simple, quick and highly effective product which replaces the need for expensive, difficult and dangerous to use chlorine granule spill kits. The traditional method is a time consuming process which is often neglected by nursing staff due to the inconvenience of using such products. This innovative product will have a major effect on dealing with spills and will save time and money as well as increase compliance. It consists of a super absorbent pad containing a special 2 layered non woven covered with a plastic backing. This pad will absorb up to a litre of fluid and once absorbed the fluid will trigger an oxidative reaction within the pad itself which will neutralise all the pathogens within the spill. It also comes with two individually wrapped disinfectant wipes to complete the clean and allow any staining from the original spill to be removed.